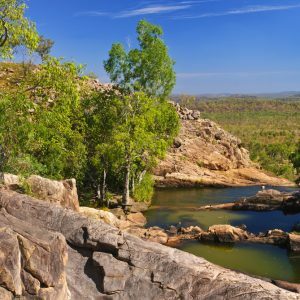 Gunlom is a sensational seasonal waterfall with a large plunge pool, located towards the Southern end of the World Heritage listed Kakadu National Park. On entering the site, there is immediate parking located next to a shady grassed picnic area. 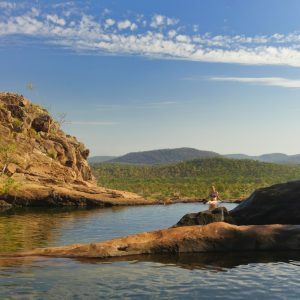 Gunlom is a sensational seasonal waterfall with a large plunge pool, located towards the Southern end of the World Heritage listed Kakadu National Park. On entering the site, there is immediate parking located next to a shady grassed picnic area. 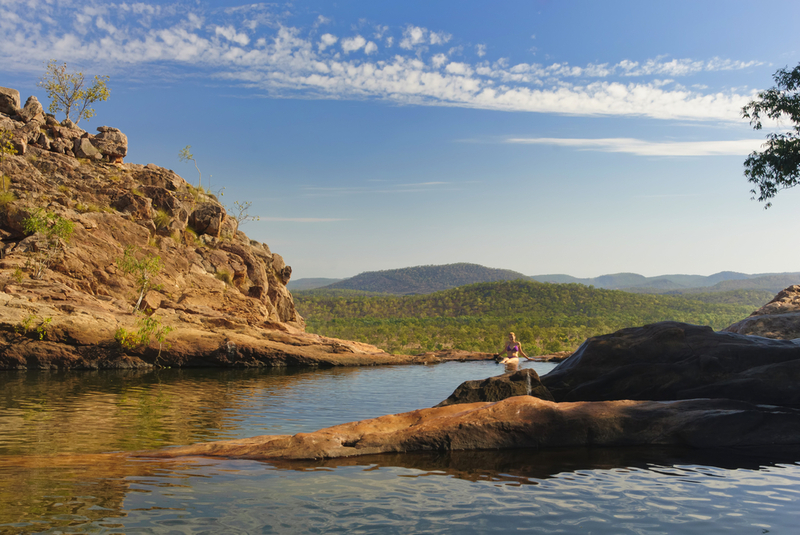 From here it is a short easy walk to the lower Gunlom Plunge Pool (approximately 100 metres). For a more challenging hike, follow the signs directing you to the Gunlom Lookout Walk. This steep climb which requires an increased level of fitness (approximately 1 kilometre return) will take you up to the top of Gunlom falls, to natures very own infinity pool. Here you can swim in the rock pools whilst taking in the breathtaking views of the Southern end of the Park. 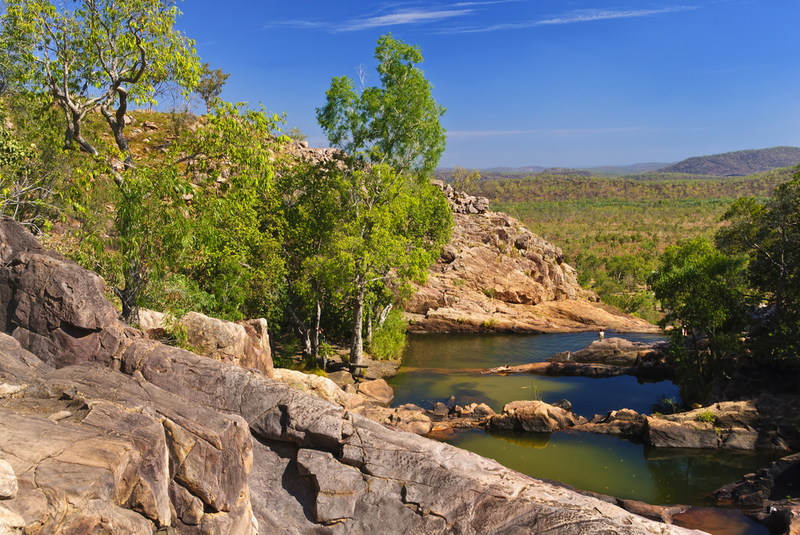 Kakadu National Park grade this walk as a difficult climb with a marked track. Most visitors choose to do this walk late in the afternoon, not only to avoid the heat of the day, but to witness the ever changing colours of the territory sky at sunset. Gunlom is extremely family friendly catering for every age and ability. Including disabled access to the lower plunge pool. Depending on the rainfall of the previous wet season, the lower plunge pool of Gunlom has recently had a beach like access allowing children to play in the sand and shallow waters. As such, sand toys, float rings or noodles can come in handy! 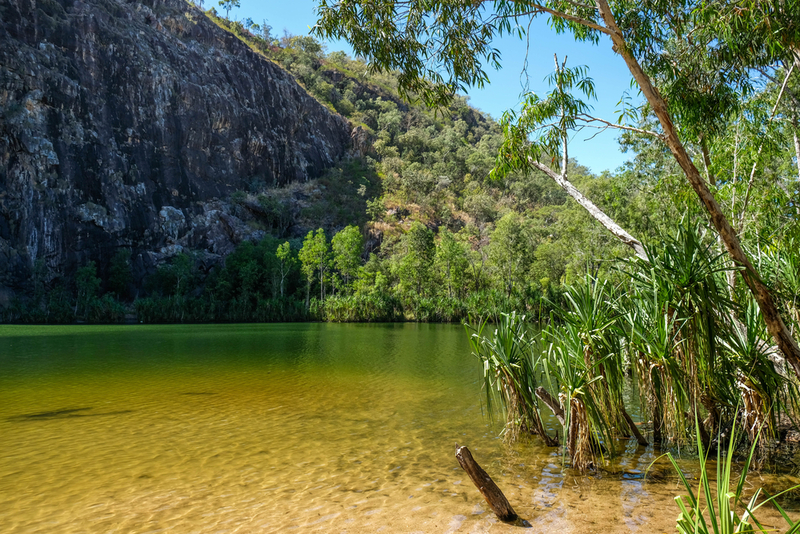 There is also a flat easy walk around a small seasonal billabong and the South Alligator River called the Murrill Billabong Walk, which may appeal to you, especially if you are an avid bird watcher. 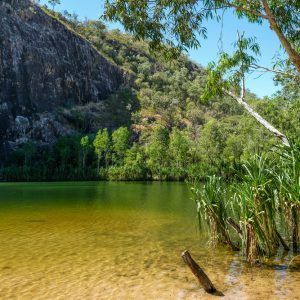 (Approximately 1 kilometre return around the billabong 2.5 kilometres return along the river). Should you decide to camp overnight, the facilities are well maintained including solar powered showers, toilets and a vast number of camping spots to choose from. If you are lucky enough you may spot a family of wild horses which come and go from the camp grounds! Facilities: Barbeques, car park, disabled access to lower plunge pool, picnic area, public toilets, solar powered showers, camp ground including multiple campsites with fire pits. Bring your own drinking water. On-site Camp ground Manager.